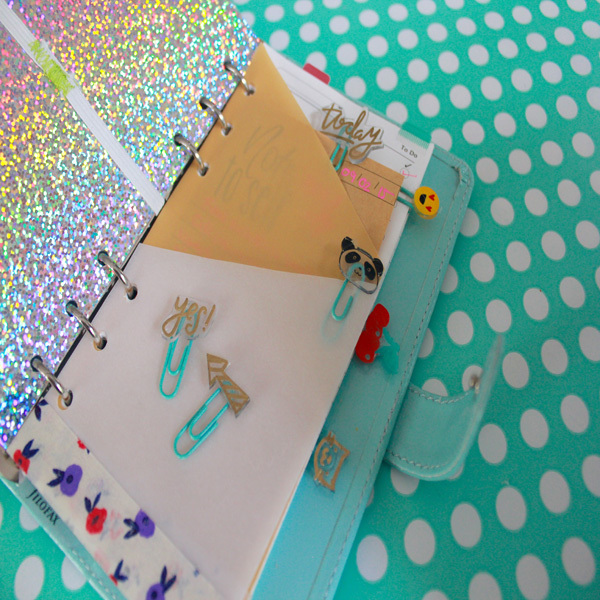 Project Description: Today I’m bringing you more DIY ideas to make your planner pretty! 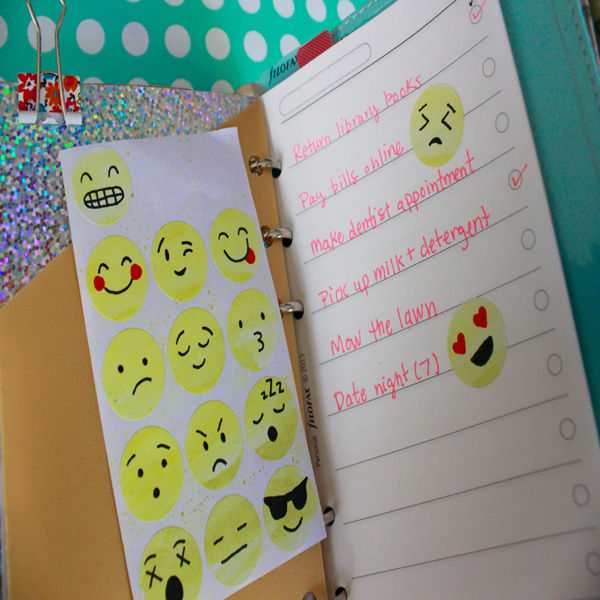 I’ll be showing you how to make a simple pen holder, cute emoji stickers, and Shrink Film paper clips! 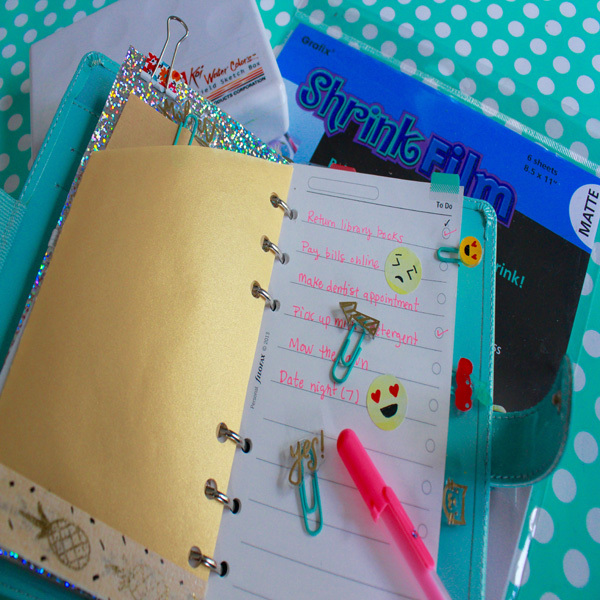 You’ll need ribbon that’s about an inch wide, and the length of your planner page plus an inch. You’ll also need elastic that’s ¼-inch wide and twice the width of your page, plus an inch. I’m using Grafix medium weight chipboard as my base. This chipboard comes in black, white, and natural shades and is very sturdy without being too thick. Trace one of your planner pages onto the chipboard using a pencil. Trace the holes as well. Cut out with a pair of scissors. Wrap the elastic around the center of the chipboard and cut, adding an extra inch. Center the elastic evenly on top of the ribbon. Overlap the ends of the elastic by about an inch, and sew together with a zig-zag stitch. You can decorate the chipboard with Gelly Roll® pens, or you can add a piece of self-adhesive Funky Film for some sparkly bling. Hole punch your chipboard sheet, then slide the pen holder onto the chipboard. 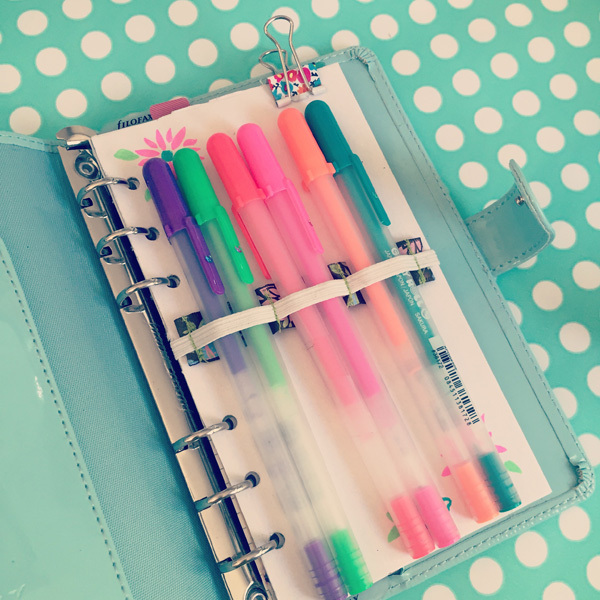 My pen holder can fit 3 fat markers, or 6 Gelly Roll® pens. Now let’s make some cute emoji stickers! I picked up these white circle stickers at the dollar store. Paint the stickers with yellow watercolor paint. I like Sakura’s Koi® Watercolor Field Sketch Travel Kit, which comes with a handy water brush. Allow the stickers to dry completely. 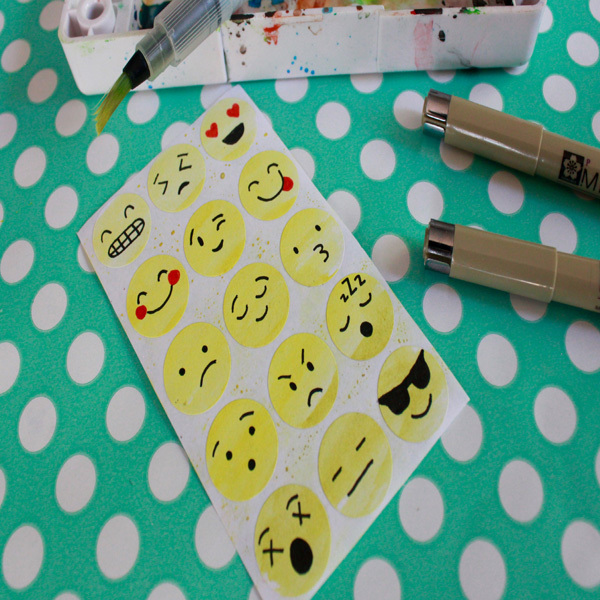 Use Pigma® Micron® pens to draw cute faces on your stickers. Add them as accents in your planner. Shrink Film paper clips are fun to make, because you can create something unique that really fits your personality! I’m using clear Shrink Film, made by Grafix. Some pens and markers work well with this product, while others don’t. My favorite type of marker to use on this is Pentouch®, made by Sakura. These are paint-like pens with a vibrant, glossy finish. They have a variety of colors as well as metallic shades. Draw your design twice as big as you want the finished piece to be. You can write words or draw shapes. These markers allow you to layer colors, as long as you give the first color a minute to dry. Cut out the shapes closely. (Be careful, as the plastic is slippery and the scissors may want to glide and cut further than you intend.) Bake according to the package directions. The best glue for this is E6000, because it dries perfectly clear while remaining slightly flexible. Add a dab of glue to the back of a shape, and then wait a minute for it to become tacky. Press the smaller end of the paper clip into the glue. Allow to dry completely before using. For Planner Project Part 1 click here.